While some in the B2B world are quickly jumping on the programmatic advertising bandwagon, many more don’t know the first thing about it or what the benefits are. That’s probably why you’re checking out this nifty little guide right now. Whether you’re a beginner with a basic curiosity about programmatic, or you have already executed a programmatic ad buy but want to learn more, you’ve come to the right place. 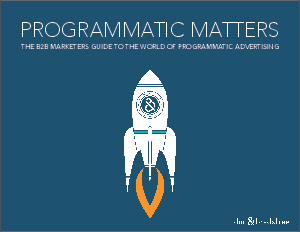 You’ll discover exactly why Programmatic Matters.